Old rural breeds from the north‑western coast of Germany and the Province of Gröningen, Netherlands . The silver and golden Mowens belong to the group of speckled fowls found in East Friesland and neighbouring territories, approximately 160 years ago. In Braunschwing, Germany, fowls resembling the golden colour Möwens existed in the year 1850. The characteristic markings of the breed, as at present, have been developed by selective breeding after the turn of the century. 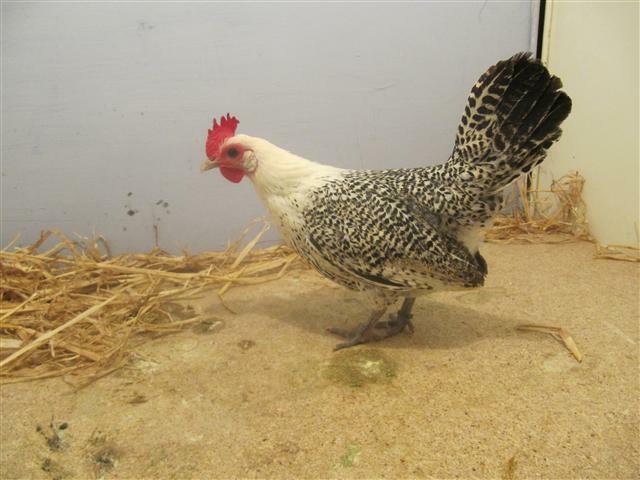 The aim has always been to breed an attractive, but hardy farmyard bird. The outstanding qualities such as rapid growth, high egg production and good body‑size have always been cherished. The breed is adaptable to bad weather conditions, are hardy and they are excellent foragers. This breed is also known as the OST Friesische Möwens and Gröninger Meeuwen.